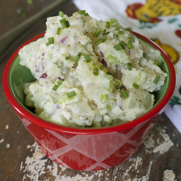 … Zesty, Cool, and Light Coleslaw for a Hot Summer Day! Need a super simple summer salad? You know, for those days that it’s just too hot to cook – or even think about what to cook? We get our fair share of those days here in Minnesota. 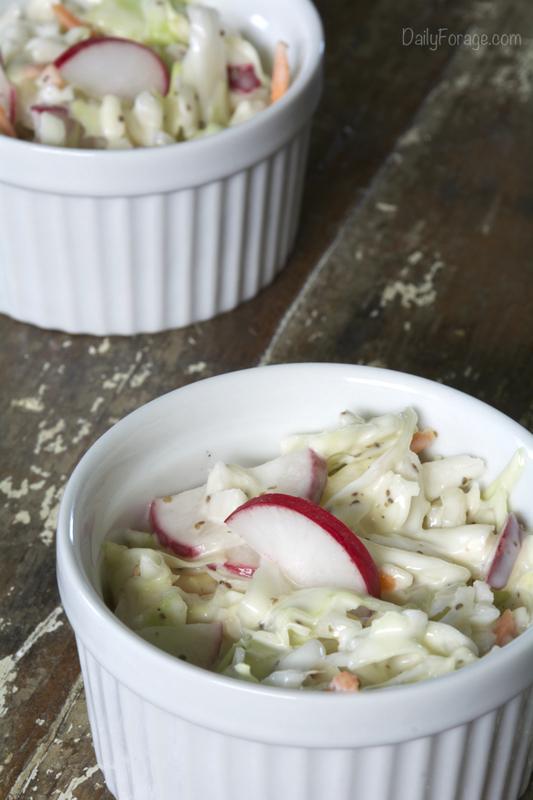 So on a day such as this, I break out this cool and refreshing, gluten-free, dairy-free coleslaw recipe. 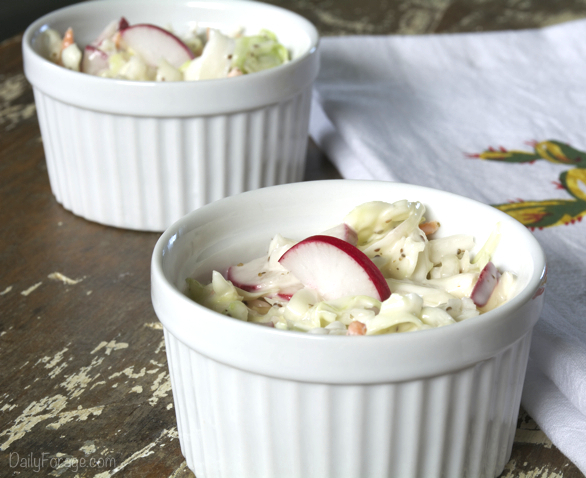 This coleslaw has delicious flavors of healthy cabbage (but not too earthy), and a zesty perk from bold radishes. I use the standard radishes from my local grocer, but any zesty radish will work just fine. The dressing that lightly coats the fresh, crisp veggies keeps the flavors refreshing and bright with a splash of rice vinegar (I think it is more subtle than apple cider vinegar) and just a hint of agave nectar. No carb loading allowed here. To really keep warm evening dinner prep easy, make this salad in the morning and chill it in the fridge until ready to serve. The dressing melds and blooms best when it’s been left alone for a few hours. Another tip? I usually like chopping my own veggies for salads and such, but if you want to keep everything ultra-simple, or have the kids responsible for making most of the coleslaw, buy a bag of pre-sliced cabbage/coleslaw mix. Yep, that’s right, sometimes we just have to cut back on energy-consuming activities … especially when it’s hot! Served with barbecued chicken, burgers, or even dolloped over some gluten-free, casein-free brats (such as Boar’s Head), this salad will please you and your whole clan. Combine cabbage, radishes, and red onion in a large bowl. Stir together mayonnaise, vinegar, agave nectar, celery seed, and salt in a small bowl. Pour over cabbage mixture. Stir well to coat all veggies, then cover bowl and chill in fridge for recommended time. Serve cold as a side salad, or enjoy spooned over your favorite burger, hot dog, or bratwurst. Note: With any mayo-based salad, be sure to keep chilled when serving in hot weather (keep bowl in ice chest, fridge, or place salad bowl over larger bowl filled with water and ice – stirring the salad often to keep all cold). Exposure to heat can spoil the dressing and may result in potential food poisoning.